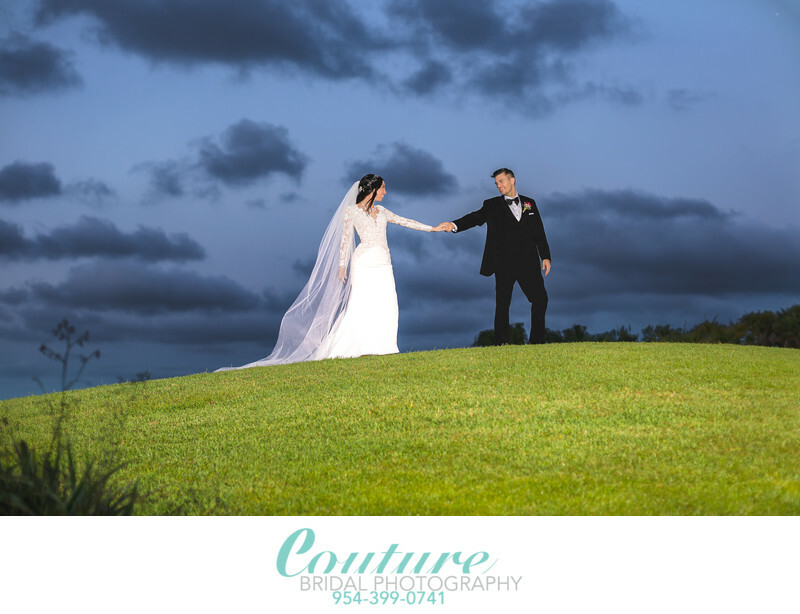 Couture Bridal Photography is the top Deerfield Beach Wedding Photography Studio for Weddings at the Deer Creek Golf Club! Bride and grooms to be choose the Deer Creek Golf club to host their weddings every year. Deer Creek Golf club is the premiere wedding venue in Deerfield Beach. The Deer Creek banquet hall is located next to a unique outdoor garden with country club amazing vistas that make Deer Creek Golf Club one of the most sought-after wedding venues in South Florida. Deer Creek Golf Club delivers a luxurious background that is beautifully landscaped for indoor or outdoor weddings. The recently renovated Key West ballroom is the perfect environment for a luxury black tie wedding celebration. The newly renovated banquet hall includes breathtaking views of lush landscaping around a stunning waterfall. The Key West Room features a spectacular 15-foot arched windows and ornate crystal chandelier accents. The hand crafted French doors open to view their spectacular waterfall. The Key West Ballroom can accommodate up to 200 guests for wedding ceremonies and receptions. Tara Horner, the Catering Sales and Events Director will make your wedding day the most memorable time of your life. We are the top rated wedding photography studio in South Florida. Based in Fort Lauderdale with an office located just steps away from the Deer Creek Golf club at 2400 Deer Creek Country Club Boulevard Deerfield Beach, FL 33442. Our unique, distinct and artistic photojournalistic wedding photography with a fashion forward editorial and glamour flair photography is the most sought after style in the United States. Couture Bridal Photography is the trend setting wedding photography studio offering the most elegant, romantic and timeless wedding photography anywhere. Couples planning their wedding at the Deer Creek Golf Club choose us over all other Deerfield Beach wedding photographers for our personalized boutique luxury wedding photography experience. We also provide custom personalized wedding photography pricing to help couples working on a tight budget. This image is Matthew and Victoria on their wedding day during their bridal portrait photography session during their cocktail hour. I photographed them using a strobe for lighting and Canon 5D3 camera with a Canon 70-200mm 2.8 lens. The image was editing using Adobe Lightroom, Affinity Photo and AlienSkin X3. I use an Apple 27" iMac that is specially modified for speed and power. As a Professional Wedding Photographer providing wedding Photography for couples at the Deer Creek Golf Club, providing the best wedding photos is our mission. Couture Bridal Photography hand edits every image to perfection using out proprietary editing style. Location: 2801 Deer Creek Country Club Boulevard, Deerfield Beach, FL 33442. Keywords: Bridal Portrait (120), Indian Spring Country Club (27), Palm Beach (114). 1/160; f/2.5; ISO 160; 50.0 mm.